For 12-year-old Joey Mendoza, sources of gang influence were all around — on his neighborhood block and in his own home. “He was trying to do something different by playing football, but he lived in a neighborhood where Norteños know that’s a Sureño neighborhood,” said reformed gang member Willie Stokes. Mendoza was walking home to his Lower Ocean neighborhood on Aug. 8, 2012 when he was shot and killed. He was at the intersection of San Lorenzo Boulevard and Bixby Street when five young men pulled up to him in a car and shot him twice in the back, killing him on the sidewalk. All five of the suspects were documented gang members from Watsonville between the ages of 15 and 19. Stokes, who coached Mendoza in football the summer before his murder, said he came from a background with heavy gang involvement, though Mendoza himself was not a gang member. Willie Stokes began selling drugs at the age of 15, and after spending 17 non-consecutive years in prison, he decided to start his own non-profit organization, called the Black Sheep Redemption Program (BSRP). BSRP is dedicated to redirecting adolescents off the path of gang influence. Photo by Aimee Hare. Stokes is an ex-member of the Latino prison gang, the Norteños. 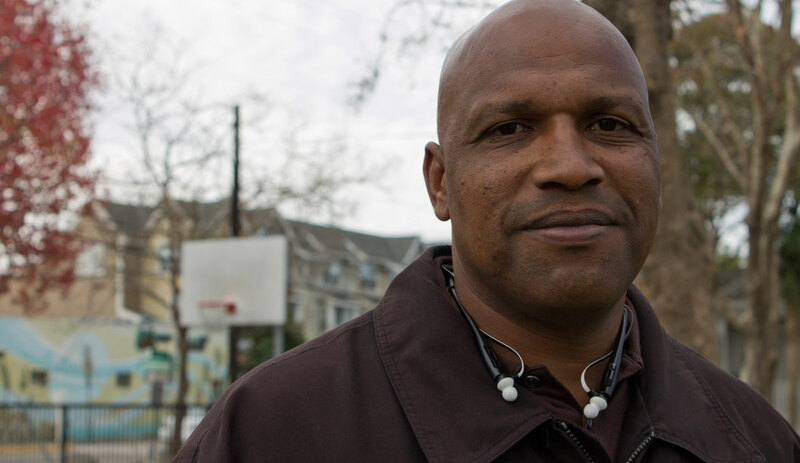 After he spent 17 non-consecutive years in prison, Stokes decided to focus on preventing youths from joining gangs with his non-profit organization, the Black Sheep Redemption Program (BSRP). The most prevalent gangs in the Santa Cruz area have traditionally been Latino prison gangs, the Norteños, or “Northerners” in Spanish — associated with Nuestra Familia (NF) from Salinas — and their rivals, the Sureños, or “Southerners” in Spanish, who are associated with the Mexican Mafia from Los Angeles. Felipe Hernandez is a representative of the community-based non-profit Barrios Unidos (BU), or “united neighborhoods” in Spanish, which is dedicated to preventing youth street violence in Santa Cruz. He discussed one of the main reasons why gangs continue to thrive. Stokes said another motivation for joining a gang is to overcome economic hardship. When children see their parents in low-skill, high-stress jobs, struggling in the face of poverty, they may try to help out and provide their families with an additional source of income. This income may take the form of a paycheck from a minimum wage job or money from drug sales. Stokes said during his time in the Nuestra Familia, he made a minimum of $4,000 to $5,000 a week just by selling drugs. Many Norteños are willing to sacrifice their lives for “the cause” — either to prison or to death itself. Stokes explained his relationship with the Norteño cause while in the NF. The “rules and laws” Stokes refers to are those of the NF constitution, which lays out the goals of the organization and the roles of its members, including its captains, lieutenants, generals and soldados, or “soldiers” in Spanish, the street-level Norteños. Gang crime in Santa Cruz experienced a significant decline in the past year, but the persisting crimes have been ones of violence. FBI Uniform Crime Reports from 2012-2013 show there was a 43 percent decrease in gang crime in the city of Santa Cruz, said Santa Cruz deputy police Chief Steve Clark. Deborah Elston is the leader of Santa Cruz Neighbors (SCN), a non-profit dedicated to facilitating conversation among Santa Cruzans. Elston said local media attention makes it appear as though crime is more prevalent than it is in reality. Infographic compiled by Maren Slobody. Gangs commit two different major types of crime, Clark said. The first type involves crimes that help support or fund gang operations and members. This can include drug sales within the gang or charging taxes to outside parties so they can sell drugs in a gang’s territory. 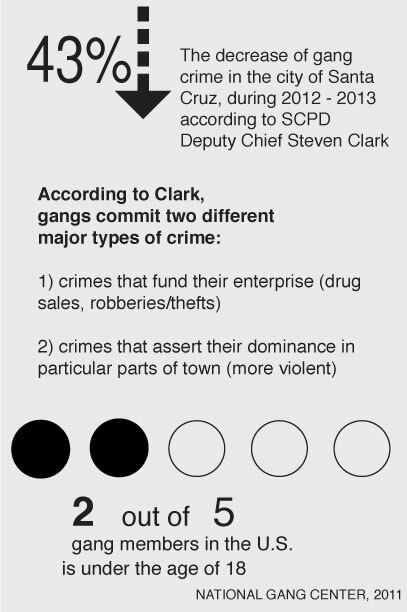 Clark said gangs may also commit crimes more serious than drug sales. “They commit crimes like robberies, thefts and burglaries to fund their ‘enterprise,’ if you will,” Clark said. The second type of crime gangs commit is violent crimes of intimidation to ensure dominance in particular parts of town. Gang members can not only be prosecuted for committing drug or violent crimes — in 1988, California legislature decided the sole act of being in a gang is a crime. Gang enhancements were introduced with the passing of the Street Terrorism Enforcement and Prevention (STEP) Act. “[Gang enhancements] depend on the individual and the crime, but they enhance the crime if the prosecutor feels it’s appropriate … It could mean a harsher penalty,” said Santa Cruz County District Attorney Bob Lee, who has been involved in gang crime cases for 30 years. When charged with gang enhancement, a person’s prison sentence can be extended by any amount between two years and a lifetime, depending on the severity of the crime. For many soldados, going to prison for “the cause” is an honor. In his book “Testimony of a Black Sheep,” Stokes explains that while the street Norteños risk their lives to rival Sureños on the streets, the NF officers sit in their protective custody cells, collecting their steady flow of income. Adolescents in these gang ridden, low-income communities are lured into the gang culture by the idea of fast money, and the belief that the reason they are selling drugs is not to generate profit for criminals in Pelican Bay, Stokes said, but to bring honor to the neighborhoods and families they watch firsthand suffer from poverty. Approximately two out of every five gang members in the U.S. is under the age of 18, according to a 2011 report by the National Gang Center. UCSC psychology professor Margarita Azmitia specializes in adolescent development. Several of her projects involved studying problem solving skills of children, adolescents and young adults, as well as how these groups manage life transitions. Some of the factors making youth susceptible to gang influence include poor school performance, low income and difficult relationships at home — all of which allow the gang to play the role of a family, Azmitia said. Adolescents in low-income communities have less resources available to them, leaving them at a disadvantage compared to adolescents from wealthier backgrounds. Barrios Unidos (BU), or “united neighborhoods” in Spanish, is a community-based, non-profit organization dedicated to preventing street violence in Santa Cruz. Some of BU’s resources include a Juvenile Hall Transitional Program, an Adult Re-Entry Program and Counseling Services for both individuals and families. Photo by Aimee Hare. The lack of funding and resources for schools in low-income communities can leave students struggling academically. With this struggle comes discouragement, causing them to look for other means of gaining respect. One of the biggest hindrances to an adolescent’s education can be their own family, if the family is entrenched in gang culture. Youths born into families with heavy gang membership may have few academic role models, thus further limiting their opportunities. When youths feel they have no one else to turn to, they may sometimes do whatever it takes in order to get accepted into a peer group, Azmitia said, whether it includes committing a crime or representing the Norteño symbols — the color red and the number 14. This is what happened to twelve-year-old Joey Mendoza. Several organizations focused on community involvement in Santa Cruz have resources for youths troubled by gang influence. Among them are the PRIDE Program with the Santa Cruz Police Department, Fight for Life with the Black Sheep Redemption Program, the Juvenile Hall Transitional Program with Barrios Unidos and the BASTA Program with the Santa Cruz County Office of Education, to name a few. Programs like these work to redirect adolescents off the path of gang activity through various tactics — classes on social awareness and personal accountability, individual and family counseling and even exposing adolescents to the life they may be headed toward by escorting them through the jail booking process, Clark said. Santa Cruz County District Attorney Bob Lee said one of the most crucial things is keeping adolescents busy during “the critical hours” of 2 p.m. to 6 p.m., the time between the end of the school day and their parents’ work day. The BSRP addresses this issue at its Peer Tutoring Center and Literacy Center in San Juan Bautista, where adolescents get help with their schoolwork and are provided with a safe space to socialize. Another organization focusing on individuals influenced by gangs is Barrios Unidos (BU). It was founded to address matters affecting the Latino community, including deportation and citizenship, with an overall goal to provide support for those affected by gang violence. 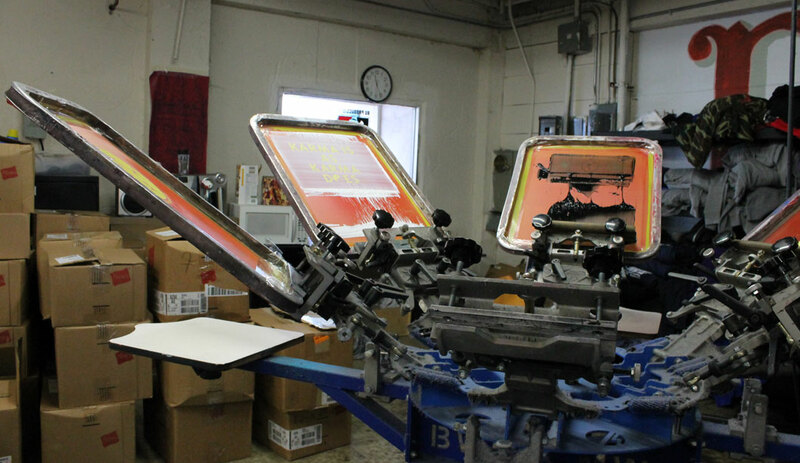 Non-profit organization Barrios Unidos runs a full-service screen printing enterprise called Barrios Unidos Productions (BUP). BUP focuses on “training, teaching and providing at-risk youth with job readiness skills in a safe and nurturing environment,” according to the Barrios Unidos website. Photo by Aimee Hare. Just as BU neutralizing the gangs’ rival status is an example of a community peacemaking initiative, Clark said although the law enforcement is responsible for arresting criminals, it is also the community’s duty to catch the problem early and put an end to it before it becomes the law enforcement’s responsibility. As seen in the NF Constitution, in most cases, once someone joins a gang, he or she is a member until death. Stokes is one of the few outliers who was able to not only successfully leave the gang life behind, but form his own non-profit, the Black Sheep Redemption Program, which focuses on preventing adolescents from making the same mistakes he did. Every day before leaving his house, Stokes cautiously checks under his front steps and around the corner to see if there are Norteños waiting for him, to take revenge on him for leaving the NF.